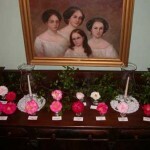 The Annual Camellia Tea of February 14 was a colorful and festive success. The guests were entertained by a beautiful table laden with tea foods and mantels and tables adorned with 150 varieties of camellias from local area gardens. Over 100 persons attended, 75% of those were from out of town, including Columbia, Beaufort and Orangeburg. 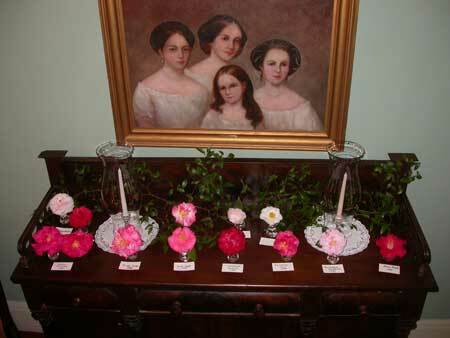 The job of gathering the blossoms on the Wednesday before and preparing the foods was done by the Edgefield County Camellia Club, headed by Henrietta Humphreys. The blossoms were carefully placed in small glass vases with names underneath to identify the plant from which it came and the year of its naming. Red was a dominant color in attire for the event – either a red blouse or red suit or red adornment – in celebration of the flower that has helped to give distinction to the gardens in our area since the 40s and 50s of the last century. That is when the Camellia Teas began, bringing experts and aficionados from the surround to enjoy the blooms as they did on Thursday, February 14. Four daughters of Francis Pickens, Ambassador and Civil War Governor, seem to be enjoying this array of camellias. 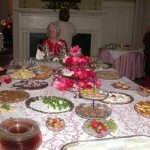 Clarice Wise attends the tea service at the end of a special “spread” which included watercress sandwiches! 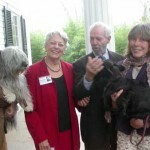 Henrietta Humphreys greets Starkey Flythe and two visitors who brought special canine guests.